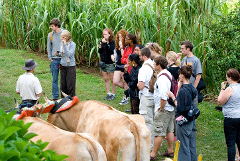 El Trapiche, a Costarican family farm where you can enjoy a unique tour, that begins with a short walk through the farm where you can get a glimpse of plantations as sugar cane, coffee, bananas, plantains, tubers, oranges and more. Schedule: 8 am – 10 am -1pm - 3pm. Duration: 2 hours. Includes Transportation. Coffee Tour Don Juan will give you the chance to learn about the growth and process of coffee beans, and how the authentic coffee used by our grandparent’s.